General Mills employs two Opportunity Partners supported employment teams at two of their locations and offers temporary supported employment for special projects at a third site. It has also hired individuals directly and brought work to Opportunity Partners’ locations. Duties involve mail room, scanning documents, kitting, repackaging and more. “General Mills embraces a diverse work culture and values people of all abilities,” said Stephanie Bredael, manager, strategic office and wellness services. “There is a fabulous team of workers that delivers mail and packages across our main general office in Golden Valley. More than two dozen individuals with disabilities from Advance Opportunities work at Mid Continent Cabinetry’s Cottonwood, plant in a fully integrated setting, performing a variety of jobs. They scan barcodes, clip labels, punch holes in doors, assemble product, bale cardboard and clean at the facility. Mid Continent Human Resources Manager Racquel Rolla said employees from Advance are positive, happy to be working and their good attitudes are contagious. They have even boosted morale for other workers at the plant, she explains. Rolla challenges supervisors to think more about other jobs that could be added to workers’ duties. Individuals with disabilities in Eveleth clean Lundgren Ford Lincoln facilities five days a week, and have worked closely with the company since the early 1980s. “They are thoroughly a part of the family fabric,” said Owner Bruce Lundgren. His father, who passed away this year, first brought people with disabilities in to work at the dealership in the early 1980s, and succeeding generations have continued the tradition. “I am honored and we are honored,” said Lundgren. “It’s been a pretty neat thing.” Lundgren said he has gotten to know a lot of the people from ERDAC, who do light cleaning in the evenings. The award was presented at the dealership before an audience that included: Bruce Lundgren, State Senator David Tomassoni, Representative Jason Metsa, St. Louis County Commissioner Keith Nelson, Eveleth Mayor Robert Vlaisavljevich, Congressional Field Representative for Congressman Rick Nolan Tom Whiteside, and Robin Harkonen, Executive Director of East Range Developmental Achievement Center. PCs for People, a nonprofit which strives to put functional computers into the hands of low-income individuals and get them online, was nominated by Midwest Special Services (MSS), a Twin Cities nonprofit which supports adults with disabilities. PCs for People provides hands-on experience through work training, internship and volunteer opportunities. It also works with other disability service providers.The company was on pace to distribute 12,000 to 13,000 computers in 2017, and it also operates an electronics recycling operation to gather equipment and materials. Individuals with disabilities help with the sorting process, and, in an upcoming phase, will be powering up computers and taking hardware inventories. Winning Employer: City of Benson, Minn. Individuals with disabilities from Swift County DAC in Benson help maintain the city’s image by mowing park areas, painting fire hydrants and other tasks. They have also cleaned city offices and other properties, assembled meter boxes and stenciled safety cones. City Manager Rob Wolfington said Benson is at a crossroads of transportation, and that it’s important for the city to make a good impression on people who are passing through. “It’s the little things that make a difference,” he said. Mowed and maintained downtown parks and fresh paint on fire hydrants apply the shine to Benson’s image, the manager explained, noting that individuals from the DAC provide reliability, quality and value. Third generation owners Tami and Larry LePier operate gas stations, convenience stores, a Subway sandwich shop and a deli. The company employs six individuals with disabilities, who work in the kitchen, clean facilities and interact with customers. Tami LePier said the individuals from East Polk County DAC are wonderful to work with, as are the support staff from the nonprofit. “They are so excited to come to work and interact so well with our customers,” said LePier. Individuals with disabilities from Rise work in HOM facilities performing a number of tasks, from unboxing, unwrapping, inspecting and prepping furniture for display, to storage and delivery. They also assemble the products. “The team as well as the leadership from Rise have proven to be a valuable addition to our organization in so many different ways,” said Dan Lentz, operations personnel and safety manager for HOM Furniture. The nonprofit and HOM have enjoyed an 11-year relationship. Other HOM employees view the team from Rise as an extension of the HOM Furniture team, not a separate organization, he explains. Productive Alternatives placement specialist Heidi Lefebvre said Cub Foods in Baxter treats each employee placed by PAI with patience and compassion. At the grocery, Cub Foods General Manager Jeff Marchand said the store has hired nearly a dozen individuals through PAI in the last three to four years, and all have been very reliable. “I love working with them. We tease them and they tease us back and have a lot of fun,” he said. Malco Products Director of Operations Deb Nistler said the efforts of Functional Industries and its associates, and their quality work have been important to the company. “They have been a joy to work with. It is exciting to see their smiling faces on a daily basis,” she said. Individuals with disabilities from Functional Industries assist with packaging and assembly of hand tool products on the company’s assembly shop floor, explains Kirk Langbehn, purchasing, planning and production manager for Malco. The company makes hundreds of different tools for the construction and automotive industries. Malco Products has been an avid supporter of the people served by Functional Industries for more than 15 years, explains Amber Oster, vice president of workforce solutions for Functional Industries. “Our individuals are so proud to work for them and have grown by leaps and bounds in the environment they offer on this crew site,” she said. Malco provides both center-based and work crew jobs, and Malco is one of the best sites to learn job skills, she explained. Individuals with disabilities from PAI perform clerical work in a highly secure financial records setting, explains Suzanne Sancilio, VP of operations for PAI. “U.S. Bank has been exemplary in their flexibility and willingness to adapt specific job tasks to suit the needs of the individual workers from PAI,” she said. The partnership provided the pilot for PAI’s “Job Opportunity and Employment Starter,” or J.O.E.S. program, a unique opportunity for individuals with autism spectrum disorder. Through the J.O.E.S. program, U.S. Bank starts new employees referred by PAI with fewer hours, and expands their hours as they become more comfortable with the job, explained Sancilio. 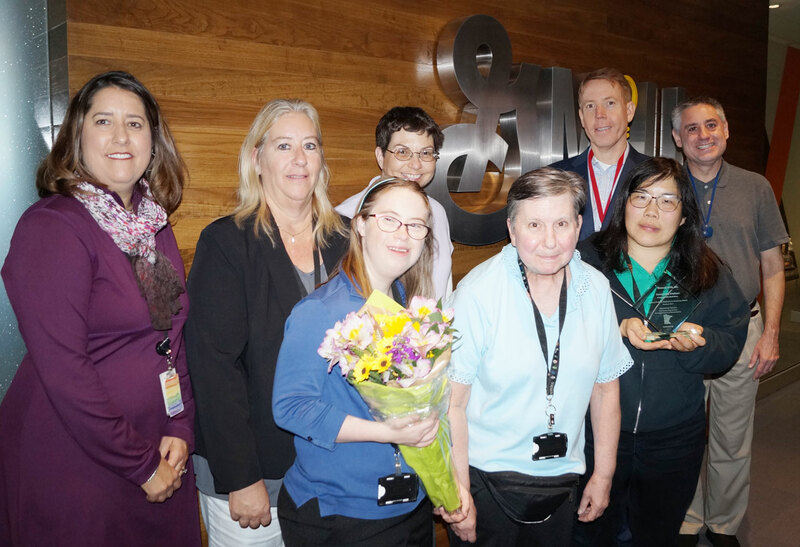 "U.S. Bank’s enthusiasm for the program’s initiation and sustainability is inspiring.” The vice president said the company is a great example of the change people have been waiting for in the intellectual disability and autism fields. Innovation drives inclusion was the theme for National Disability Awareness month, but Chanhassen employer, Waytek, Inc., is the real-world example in action. Through a partnership with MRCI, Waytek employs numerous individuals with disabilities at its Chanhassen location. MRCI clients help fill orders and complete numerous other tasks that contribute to the company’s success. Waytek is a family owned business that prides itself in offering high quality electrical wiring products, at a competitive price with an exceptional customer experience. Waytek is an example of what can happen when employers are open to creating inclusive opportunities for all and an exemplary example for others to emulate. “We are honored to partner with such an outstanding organization. Ironwood Springs is truly a model employer that is making a difference in southeastern Minnesota,” said ABC Executive Director Bruce Remme. Individuals with disabilities from ABC cover room cleaning duties at Ironwood Springs’ Miracle Lodge. “They do a great job of making sure rooms are turned over for guests who are arriving for the week,” said Jaimi Stejskal, director of programs and marketing for Ironwood. The nonprofit operation began in 1976, first serving as a camp for youth with physical disabilities. Its mission was later expanded to include people with cognitive disabilities. It also serves many veterans. Lynda Kuscienko, Job Developer at ABC, said Ironwood Springs focuses on community, inclusiveness, overcoming obstacles and finding value in all individuals, whether they have a disability, or not. “Staff at Ironwood are friendly, welcoming, accommodating and patient,” said Kuscienko.